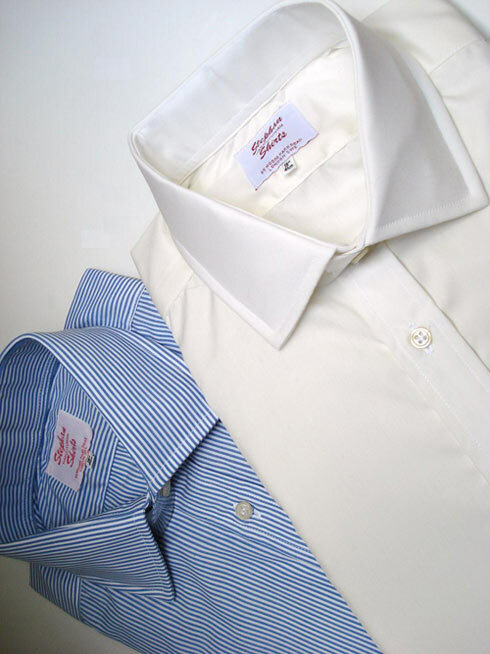 Last weekend I decided to pay a visit to my friend Erlend at Stephan Shirts. He’s kindly been advising me on my button down shirt project. But there was another reason for popping into 95 Moore Park Road, Fulham. That reason is pictured above, the cream/off-white shirt in the foreground. Having rationalised and simplified my shirt collection over recent months in favour of white, blue, Bengal stripes and the odd pink I’ve managed to completely neglect this most useful colour. Obviously, cream and off-white sits sympathetically with browns, greens and the earthier colours contained in classic tweeds. But as a shirting its usefulness goes beyond that. Firstly, if you’re pale skinned or you have grey hair, as I do, you might want to consider cream and off-white as an alternative to plain white shirts. Whereas white shirting can often reinforce that pale paler, cream and off-white provide a little reflected colour and an element of warmth to your look. Funnily enough it also works in the opposite way. A heavy tan or five o’clock shadow can be deemphasised by use of cream and off-white shirting, whereas pure brilliant white shirts simply emphasise these traits by making the contrast of colours appear starker than they need be. In a very similar vein cream and off-white are a nice alternative to pale blue shirts, which when combined with solid grey and navy suits can look a little cold. For those unsure about combining colours, I would add that cream and off-white shirtings are about as versatile an option as you could wish for. It combines with navy and grey, and all the variations thereon. Indeed some blues, like petrol blue for example, can sometimes benefit from being toned down a bit. That tonal balance likewise applies to bright ties and bold patterns which become gentler on the eye. However, with regard to patterned ties, avoid combining patterns with white in them as next to cream and off-white it merely makes the shirt look grubby. You might also extend that rule to Prince of Wales check cloth where the ground is white and chalk stripes, for the same reason. Other than those two caveats, you’ll find cream and off-white worthy editions to your shirt collection. Previous Post Should I Listen to My Tailor?